kapunda garden: Prickly pears and rain. It's been a busy month... not so much in the garden, but in the rest of my life. I am back to working (part time) to pay off a debt that I have inherited, and so the garden has been rather neglected. With the equinox having just passed (last Sunday afternoon ~ 20 March 2016) I am really going to have to be a bit better organised. I have been picking prickly pears. There have been plenty. Once inside, the prickles can be softened by soaking the fruit in water. I then scraped them with a sharp knife to really remove the spines.... but this has to be done pretty carefully. .... peel and cut the fruits and they are lovely. There are seeds in amongst the flesh, but I haven't bothered to remove those. ... and this year they seem to be particularly lovely, and plentiful. After more than 2 inches of rain this month (~ 60mm = 2.3") the forgotten potatoes are beginning to emerge. (These are the ones that escape when I'm digging the rest, ones that I just didn't see!) This also means that it is well and truly time to plant the post summer crops, ready for the rainy season. I haven't sees a blood lily before. It looks great. Are they edible? 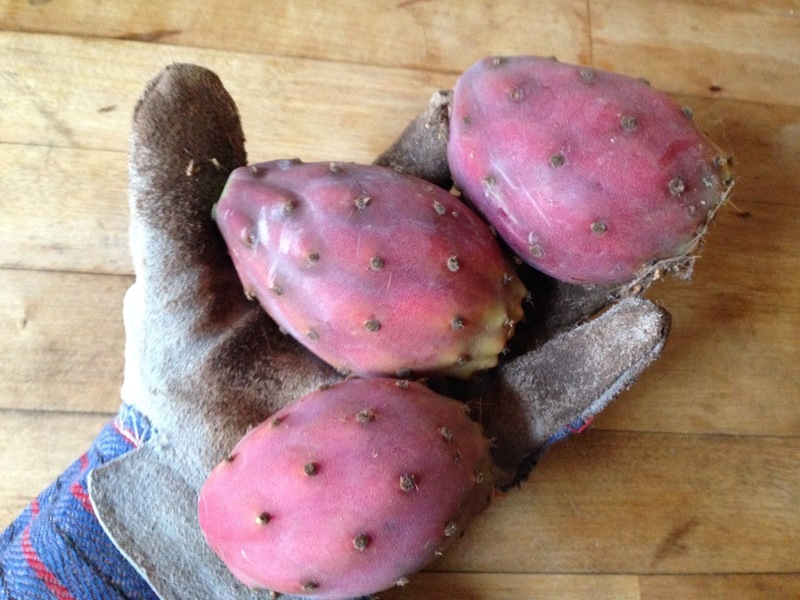 Blood lilies aren't edible, but the prickly pears are.